Edit: Literally just as I published this, the Met and various unions announced that they have extended negotiations for 72 hours and at least temporarily averted a lockout. Keep an eye on developments via Google News and on Twitter. Here’s hoping this entry becomes irrelevant, and soon. Click here to read the Met’s statement (which is, at this early juncture, the best I have right now, since no news outlets have had time to write up the development, and I need to go to bed). It looks like we’re rapidly hurtling toward a Met lockout, and so to…er, celebrate isn’t quite the right word…to commemorate…to observe the occasion…I thought I’d jot down a few informal tips for various stakeholders. Your mileage may vary with these; they are just some preliminary thoughts from the perspective of one music-loving audience member who was present for the length of the knock-down drag-out hell-fight that was the Minnesota Orchestra lockout. I encourage my wise readers to add their their own survival tips in the comment section. Recognize how devastating a shuttered or diminished Met would be, not only to you personally, but to your city and even to your country. Connect with other organizations who have been through similar implosions and who have helped to drive constructive resolution. I’m thinking about Save Our Symphony Minnesota and Save Our Symphony Detroit, especially. They are nice people; they care about art; they can help you. Remember that in this day and age all it takes is a Facebook page to create an effective gathering place for concerned patrons (see: Save the San Diego Opera). Social media is especially effective in the music world, where everyone is only a degree or two of separation away from each other. If you’re a writer, and you’re clever, and you play your cards right, you could make a career out of this. Camp on the story, cancel your plans for the next few months (I’m only half joking about that part; *speaks from experience*), and write. There is a massive audience hungry for information about what is going on, and that audience will only grow. Writers will need to be on this thing full-time to interpret all the spin and rapid-fire developments. Try to absorb all the information you can – from all sides. Be skeptical of everything. I know this isn’t a very polite question to ask, but – who is the most important stakeholder in this dispute? I mean, obviously everyone in an arts organization is important, but if, gun to your head, you had to choose The Single Most Important Stakeholder, who would it be? It’s not Peter Gelb. It’s not the board. It’s not the musicians. It’s not the union leaders. It’s you. Without an audience, there’s no reason to have grand opera or indeed the Met. You are the most important stakeholder. Act like it. We can all agree: the Minnesota Orchestra lockout pissed us off. There was no louder critic of the Minnesota Orchestral Association than this blogger (although Robert Levine, Norman Lebrecht, Alex Ross, and Bill Eddins all gave me pretty fierce runs for my money). But here’s a more important, more relevant question: Does the Minnesota Orchestral Association still deserve my ire? I’ll acknowledge that being pissed off does wonders for the page views, but here are the facts. Michael Henson is leaving. He has about seven weeks left on the job and then he’s off to…a Bournemouth beach house? memoir writing? consulting with the Met’s management? Point is, his reign of incompetence is nearly over. Halle-fricking-lujah. Richard Davis and Jon Campbell are gone (well…officially; one assumes they have influence in the philanthropic and business communities, but – that’s the nature of the beast). Even more impressive? The remaining board representatives are now working with audience advocates. Osmo is back. Repeat: Osmo is back. The 2014-15 season is the best the Minnesota Orchestra has presented in years. It’s big, bold, ambitious, beautiful. This is the first time that I’ve looked at other big city seasons and thought, you know, Minneapolis’s season reigns with the very best. Yep, mark my words: the best orchestral music in North America will be happening at 1111 Nicollet Mall, Minneapolis, Minnesota, ZIP code 55403. And you don’t want to miss it. Kevin Smith, the Minnesota Orchestra’s interim CEO, is giving every indication of being The Anti-Henson. Seriously. Everything Michael Henson did, Kevin Smith is doing the opposite. Just one example: Henson scurried with bodyguards through the back door of Orchestra Hall during Save Our Symphony’s “Ending The Lockout Will Be A Ball” rally in September 2013. Kevin Smith, on the other hand, has actually already talked with SOSMN, and has even scheduled two listening sessions that will be open to the public in August 2014 (follow Save Our Symphony Minnesota’s Facebook page for details as they become available). I have also heard some great things about new Vice President of Advancement Dianne Brennan. Mr. Smith will be here for anywhere from six months to a year; Ms. Brennan is here long-term. I think every rational outside observer believes that the Minnesota Orchestral Association is brimming with untapped potential. But here’s the flip side: that potential needs time to blossom. It won’t – it can’t – flower overnight. And as every gardener knows, you have to take care of a plant before it blossoms to enable it to blossom. Yes, I acknowledge that MOA executive committee board member Doug Kelley is still having trouble coming to grips with reality, but I admit there’s a part of me that wonders… If he’s representative of hardliners on the board… And if the hardliners are waiting to bring his attitude into the next negotiating cycle… Might his words actually be an inspiration to give? To prove him wrong – to weaken his position in whatever way possible – to cut his arguments off at the knees? I genuinely don’t know the answers to those questions. In the end, you’re likely going to give in spite of his viewpoint, not because of it. I COMPLETELY understand if you don’t want to give to the Minnesota Orchestra yet. Concerned patrons have been BURNED, with a capital B, U, R, N, E, and D. But I also encourage you to send a small amount of money with a promise of more once benchmarks of your choosing are met. 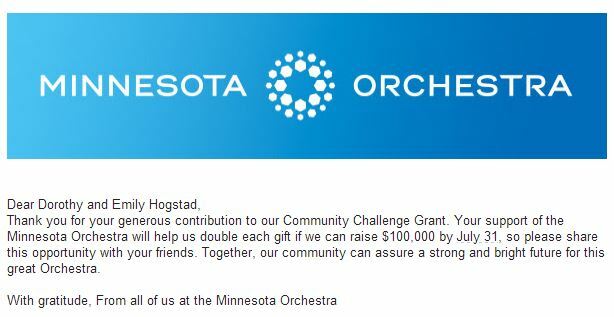 Or perhaps you could send an email to the Minnesota Orchestra explaining why you aren’t contributing yet. If you don’t have faith that your emails will be read (and yes, it is true that many negative emails went unacknowledged during the lockout), CC Save Our Symphony Minnesota (saveoursymphonymn at gmail dot com), and I can offer you a personal guarantee that they will get to the people within the MOA who need to see them. My mom and I gave! Yep, the Minnesota Orchestra is in the midst of its #CommUNITYinConcert fundraising effort, in which every dollar up to $100k will be matched in July. My mom and I really liked the idea, and we discussed the pros and cons of the investment, and then we gave. I followed the Minnesota Orchestra lockout from the beginning (well, from before the beginning). I’m pretty sure there’s not another “civilian” who knows the ins and outs of the conflict better than I do. I milked the negotiating incompetence of the Minnesota Orchestral Association dry. Hell, I came close to making a career out of it. Will I regret the decision this time next year? Maybe. But right now the MOA is moving in a positive direction, one that was unimaginable six months ago. And I feel it’s important to send the message in my own very small way: this change is good. Of course I sincerely hope you join me – but I also understand if you’re not ready yet. Okay. So despite the topics of my last few entries, it’s not my intention to turn into a promotional arm for the Minnesota Orchestral Association. But I did want to talk one-on-one, friend-to-friend, about these two hugely important initiatives, and offer you a chance to give if you feel so moved. I hope I’ve given you something to think about. If I haven’t, well, then sit tight, because there’s a lot more content coming. And if you want to chat about this whole big ambiguous topic, the comment section is open, as always. Anywho! I’ll see you at Orchestra Hall this fall, as we all commit together to making a fiscally stable world-class orchestra in Minneapolis a reality. I haven’t checked in here for a while, and y’all are probably wondering why. For what it’s worth, I haven’t been idle. I think I’ve written the equivalent of several novels in private messages with friends…dissecting the settlement, examining tea leaves, and coming to grips with a new era. Lots of people have been taking a “what have we learned?” approach to the Minnesota meltdown. So I’ll zig when others zag and try out a “where are we going?” premise. Without further ado, here are my best predictions of what happens next… Feel free to agree or disagree. Taxpayers will finally get to see the renovation they paid $14 million for. There will be some bitterness about it, given what we’ve lost. Also, people will be very critical of the light fixtures in the lobby (…and if you aren’t, your taste in light fixtures is highly questionable). (wink wink) Others might like the aesthetics of the renovation, but then they’ll start noticing certain things… A bar taken out. Floors that are easily stained. Seats that weren’t reupholstered with the rest. Shoddily constructed signs. (For instance, there was one photo that made the Facebook rounds a while ago in which a letter in the Box Office sign had already fallen down, only a few weeks after renovations had ended.) One wonders if the auditorium escaped unscathed. Questions might start to arise about the quality of the renovations…and that could quickly turn into a Pandora’s Box. I really hope I’m wrong on this point, but we’ll see. It will be well attended. The desperate edge to the audience’s energy will slowly diminish over the months, but the motivating drive will remain. We will not soon forget what was taken from us. The energy of Minnesota Orchestra concerts will be totally unique, and visitors will remark upon it. And I think that energy might unnerve Michael Henson. One thing that made me laugh recently was MOA board member and frolic and detour catchphrase originator Doug Kelley saying he wanted the energy of the musicians’ indie concerts to find its way into Orchestra Hall. Bwahahaha. I wonder, Mr. Kelley, why there was energy at the musicians’ concerts?? Hmm. It can’t have been because the community was furious at what the board was doing, because surely if that had been the case, Mr. Kelley would apologize for that, so… Why were we all so hepped up? Did the musicians slip us drugs???? I don’t remember. It’s all very puzzling. Why was there such energy? Why? Anyway. No worries, Mr. Kelley. There will be energy. Maybe not the kind of energy you want, though. I’m guessing that some orchestras that might have tried Minnesota tactics will choose not to based on what happened here. However, I can also imagine other boards and CEOs doubling down on their nefarious plans, betting their musicians won’t be able to hold out for the length of time the Minnesotans did. A lot of this will probably depend on the economy and the performance of various endowments, and the political moods in various places around the country. Are likely here to stay. Save Our Symphony Detroit showed that audience advocates can make a difference, and the folks at Save Our Symphony Minnesota proved it. What orchestra comes next? Will the activists in that city continue the trend? I’m incredibly proud of what activists did in this situation. So proud. They will play better than ever. They’ve been to hell and back – and they survived. Not only that, but they went to hell with their audiences…and their audiences brought them back. This experience will increase the depth of our music-making. I say “our” because this specific audience will be a vital part of the power of every future performance. The audience will have a real ownership in the music, even if we don’t play a single note. Nonetheless, some people will leave for good. (Happily, at least one or two will come back. Maybe more. I can’t wait to cry with happiness as I welcome each one home – where they belong. Because I am goddamned sick and tired of crying over my losses. Sick and f’ing tired of it.) I’m guessing the musicians who do leave will always feel a little bit of loneliness in their new jobs, because they survived something unique in American music history, and people who didn’t survive the meltdown with them will never understand an important part of what makes them, them…? But they will contribute to their new communities, and we will all wish them well. Of course. The newcomers will probably tire of hearing stories about The Lockout, and be confused when we talk about stuff like frolic and detouring and $200,000 and tap-dancing munchkins. You had to be there. Oh, God, do we really have to go there? I don’t want to go there. I’m still tired. But let’s hope for a repeat of what just happened in Detroit: a contract settled eight months early…with wage increases. Osmo will be back if the board wants him…and is willing to kick out Henson. Question is: will they? It would be a wise business move, but then again, the board has never been very good at recognizing wise business moves. Regardless of what happens, Osmo’s musical legacy will remain with the Minnesota Orchestra for years to come. It’s become part of the orchestra’s DNA. And that’s a great gift. He has lost power. It remains to be seen how much…but he has lost power, along with a crap-ton of credibility. My gut instinct is that he’s a lame duck. Or as Robert Levine suggested, toast in a toaster. (Have you noticed that Henson hasn’t really spoken in the press at all on behalf of the MOA? It’s almost like he’s been asked not to talk. What’s up with that? Is the MOA nervous to have their own CEO speak on their behalf, even after a settlement has been reached? If they are…well, that says a lot. If people just aren’t seeking out his opinion, well, that says something, too.) He may still try to pull his old tricks, but…When your orchestra CEO can’t stand up in front of audiences for fear of being booed off the stage, you might have a problem. Hopefully the MOA knows that people like me, Scott Chamberlain, and Save Our Symphony will be on Henson’s case if he tries the kind of stuff he tried eighteen months ago. He simply can’t get away with what he used to without a well-organized and well-publicized backlash. If he doesn’t understand that yet, he will soon enough. Promise. If he wants to make a fresh start (or is forced to make a fresh start), I believe he’ll be able to massage his resume to make himself attractive to some organization somewhere. He did oversee a $50 million lobby renovation, a recovery in the value of the endowment, and a 15% reduction in musician pay, after all… Let the rewriting of history commence. They’ll go back to whatever the crap they do whenever they’re not destroying orchestras by cutting them to death. I hear there’s a governor’s race coming up. That might be a fun, rewarding extracurricular activity for them to devote themselves to! They will have to figure out what exactly the crap just happened. I have to believe board members have a bit of whiplash. How to reconcile what they were seeking with what they ultimately got? I don’t know, and I’m glad I don’t have to be a part of that debate. The cognitive dissonance there would give the Second Viennese School a run for its money. The person who is nominated for board chair, and the behavior of that person in the coming months, will tell us a lot. YMM will continue, and continue to be amazing. Emily Green will go on to do important things…that never could have happened without the lockout and the havoc it wreaked. That will be one of the lasting paradoxes of the lockout: hugely great things have come directly out of the destruction, and will continue to come directly out of the destruction. Even if we’re too close to the situation to see those things now. SOTL’s views will likely trend downward. Scandals like Domaingate and Bonusgate will be things of the past (…um, I think?). I have a hard time imagining that the hard slog of rebuilding will be as dramatic or compelling as the work of railing against an unjust labor dispute built on the ugly foundation of public deception. I mean, I’ll still be here, obviously; and people will still be reading me; I just don’t think I’ll be read as widely. Soon I’ll go back to reading and writing about the history of women in music, then I’ll remember that nobody actually gives a crap about the history of women in music. I’ll start to miss the feedback, so I’ll try to find a balance (balance? what’s that? ), and I’ll either return to fiction after a long absence, or I’ll write a book about the lockout, which will be published by a small regional press. If I ever get to New York City, I’ll get an autograph and a picture with Alex Ross. And then ——- I don’t know. Oh, it will happen. You know it will. It’s only a matter of time. *wink* Leave your casting suggestions in the comments! So there you have it: my completely unscientific predictions on what happens from here. I may be intuitive, but I’m no psychic. So who knows, really. Nobody does. Nobody. What are your predictions for the future? If they’re positive predictions, what do we have to do to realize your vision? If they’re negative predictions, what do we have to do to avoid those outcomes? And how will you make a personal commitment to make the positive visions a reality? For some reason…(God only knows exactly why)…we’ve stuck with the orchestra this long. Are you ready to keep working for it? I hope so.